How can I get from Bucharest to the park, other than by personal car? 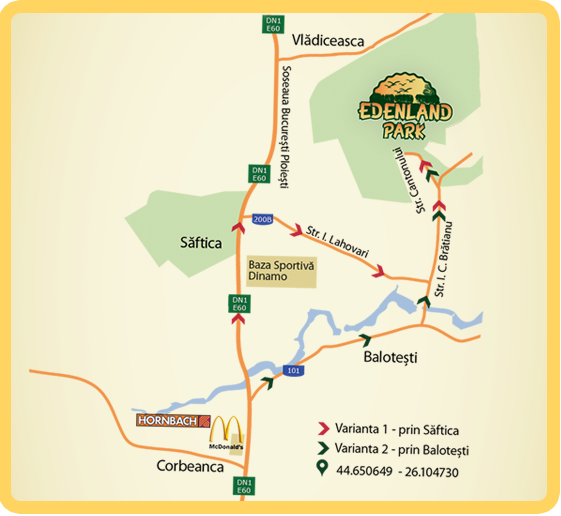 From Piata Presei Libere (Bucharest) you can take every minibus arriving to the exist of Otopeni (Magura) and RATB 449. Then, from Otopeni (Magura) you can take the local transport of Balotesti county – details HERE (in Romanian only). From the last station of this transport, there are about 900 meters to walk to the park, following the specific orientation signs. 08:30 – 17:30 (monday – friday) / 10:00 – 18:00 (saturday – sunday). Edenland Adventures is an authorized operator for processing personal data, registrated at ANSPDCP a 29240 , in accordance with the provisions of law No. 677/2001 for the protection of individuals with regard to the processing of personal data and the free movement of such data. Edenland Adventures is determined to manage, absolute certainty and only for specified purposes the personal data which you provide to us about yourself, your family member or other person. The purpose of collecting data is related to the activities of marketing and advertising. Also, in accordance with the provisions of law No. 677/2001, you have the right to access the data, to interfere, the right not to be subjected to a individual decision and the right to address to justice. You also have the right to oppose to the processing of your personal data and request deletion. To exercise these rights, you can contact us with a written request, dated and signed at: Cantonului Rd., no. 12, Bucharest-Ilfov.